Calligraphy has many rules. Each kanji has some shapes such as Kaisho, Gyousho, Sousho, Kana, they are quite different and it’s not easy to remember all of them. Moreover, the knowledge of Japanese literature and Chinese poetry is needed to choose them for a subject. So calligraphy is constrained by cultural elements that cannot be compared with Sumi-e which has a lot of flexibility. All the more reason, it is interesting to express something on the paper. It is really exciting. What I drew today is a poetry of Hakushu Kitahara ‘Umi-suzume (murrelets)’. This is a subject of next month’s study meeting. 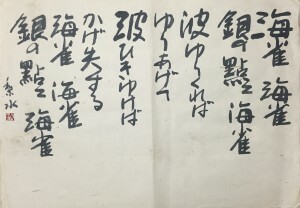 In this short poetry, there are six 海雀/murrelets, two 波/waves and 銀の点点/silver dots. It is very difficult to draw such type of poetry because we have to draw the same kanji with different shapes. Or it cannot be an art work but just a Shuji/practice. I dew more than 30 patterns before this one. I wonder if I could draw an interesting one. In fact, I didn’t know what kind of bird murrelet is. 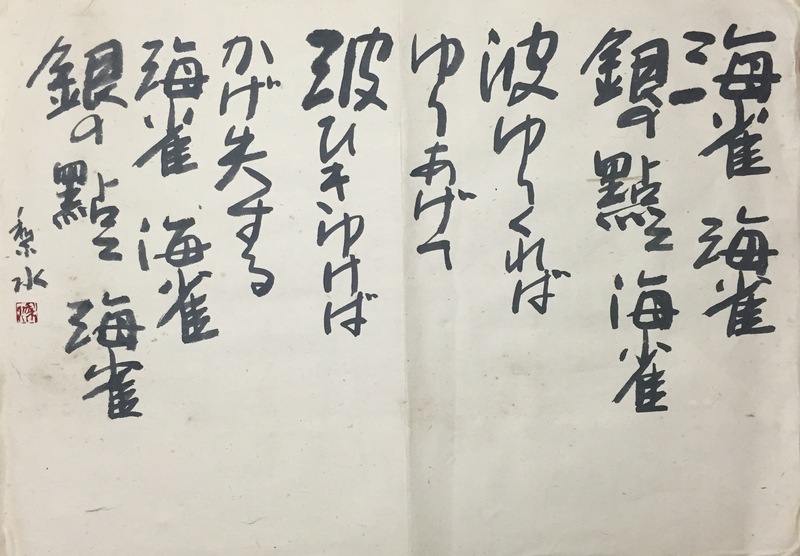 When I first read this poetry, I imagined it was a small bird like a plover, so I drew the Kanji of 海雀 much smaller on the horizontally long paper. But one day I saw them on the internet, they were much bigger, as big as seagulls and had a funny face. Then I changed the shape of paper and I drew them bigger. I hope that you see them coming and going among the waves. Copyright © RISUI, All rights reserved.